Falkirk defender Jordan McGhee says the Bairns are not creating enough chances, after their 2-1 defeat at home to bottom of the league Alloa Athletic. 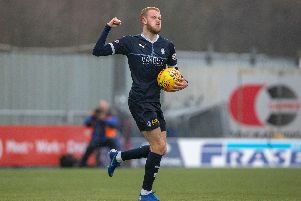 Falkirk went into the match at home to the bottom club off the back of a 0-0 draw with Inverness and a 1-1 draw with Queen of the South, in which they bagged a 93rd minute penalty only to be denied a victory in the 96th minute. 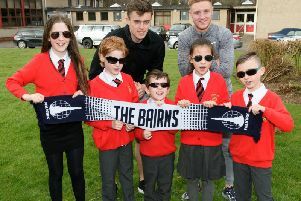 McGhee lamented the lack of creativity in the side in general - but noted that the Bairns had plenty of opportunities to beat Alloa on Saturday. "It has been happening for a while, we have not looked like we have been creating much recently. We have been defending well. Even at Queens we didn't create many chances, only a few. "But we created a few chances at the end (versus Alloa) and never took them so that's disappointing. "We started the second half well, got on the front foot and created a few chances, didn't capitalise on them and got punished at the end by one long ball." There are four matches remaining now for Ray McKinnon's side as they attempt to stay in the Championship - with the next a trip to rivals Dunfermline. "In my opinion we need to win all four almost," added McGhee. "It's going to be difficult, but we need to do it. It's something that has to happen. "They are all tough games in this league. Every team is capable of beating one another as we have seen this season so there's no reason why we can't dust ourselves down. "We just need to do it. It's something we have to do. It'll be tough but we have to do it"